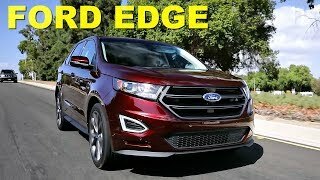 Ford aimed to diversify its lineup and brought elegant model Ford Edge 2016 to fascinate the competitive market. It stands as a nice complement to the models like Escape, Explorer, and Flex after being redesigned this past year. It is a better model for those who want more versatility, convenience, and better seating position. 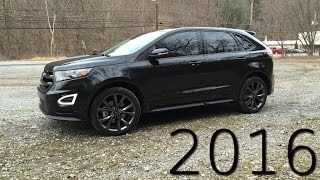 Let us have a close look at the review of Ford Edge 2016 and get to know better about the handsome model. The interior of Ford Edge 2016 has dynamic features. It contains the ventilated front seats, and a power liftgate, an auto-dimming driver’s-side exterior mirror, and a power-adjustable steering wheel. It is also aided with rear-seat DVD entertainment, a power panoramic sunroof. There are standalone options like a front-mounted camera, upgraded wheels, voice-activated GPS navigation, and upgraded leather upholstery. Standard safety features are also aided with 4-wheel antilock brakes, traction and stability control, front side-mounted airbags, front and rear head airbags, daytime running lights, and a post-collision safety system. It is also tech-focused with the features like new Sync 3 infotainment system, true capacitive screen interface, streamlined menu system, and easier upgrades. These all features can take Ford a step forward especially in the interior designing. 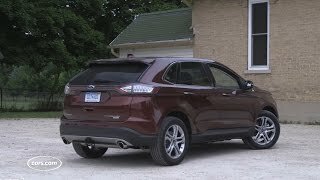 The exterior of Ford Edge 2016 has enormous look with a sporty appearance. It is one the athletic versions according to Ford. The new model now has some of the best trims and materials in its class, and a dash shape that builds on some of Ford’s other models like the Focus and Escape. It provides with the rear monotube dampers, and standard 21-inch wheels, with 20s as an option and a rear spoiler on the outside. It also provides the features like voice-activated GPS navigation, LED headlamps in the front and the power panoramic sunroof. 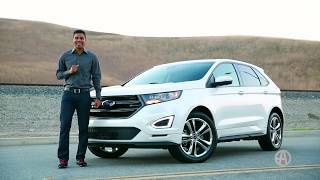 The Ford Edge 2016 has base engine which is turbocharged with 2.0-liter EcoBoost. The power out of the model is 315 hp with 508 nm of torque. There is a redesigned cylinder ahead to enhance the power out of the model. 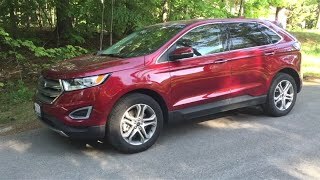 Standard safety features like 4-wheel antilock brakes, traction and stability control, front side-mounted airbags, front and rear head airbags, daytime running lights, and a post-collision safety system are provided which adorns the 2016 Edge trim lineup.